The S3H holster component is made for pistols, and will work with our Miami Classic, SSII, and our half harness systems. It features a tension screw adjustment, thumb break and will accept a tie down. The S3H holster component is constructed of premium saddle leather. Had a plastic piece sticking out approx. one quarter inch. when snapped into place it rubbed against the gun finish. also made closing the snap more difficult. had to cut it off. Easy to order, and fast to my door. The holster is very high quality, I wasn't expecting anything less though. I already have a Galco holster for another piece, and that is still in great shape after years of use. Everyone knows that Galco makes a great holster, so when I was looking for this particular holster, I found it on this site. It was one of the least expensive holsters that I found while searching. After purchasing, the shipping was fast. CopsPlus is a great website. Very durable. 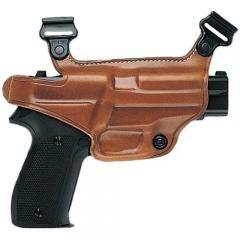 I use this holster for all my guns.